Once your little one starts crawling or walking, every areas and furniture in your house suddenly become dangerous. You’ll need to start child – proofing your home when your baby can no longer be cool down in a crib or playpen. One of the most necessary measures is by choosing a safety gate for your stairs where your kids are probably in danger of falling. And particularly when the stairs are concrete, a fall could be a risk of acquiring a head trauma or worse. ​What Type of Baby Gates Should You Buy? ​Do you have stairs? Do you have a baby? If you answer yes to the two questions, then it’s time to think of buying a baby gate. 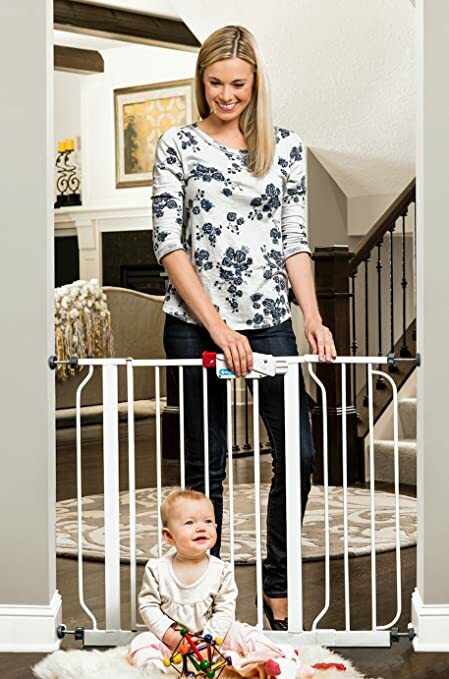 To make sure your child’s safety is guaranteed, this list of the best baby gate for stairs are your initial line of defense against accident-prone areas. ​First off, there are two types of interior baby gates available in the market: hardware-mounted and pressure-mounted. Hardware-Mounted is the safest solution when installing correctly. It is screwed firmly into your doorframe, banister, or wall to anchor your gates. Can stand with enough pushing; not a chance to be tumbled by large dogs. No rail at the bottom that will typically cause a tripping hazard. Unless it got a quick-releasing feature, it could not be loosened or removed hurriedly. When detached, holes in woodworks or walls can be left over. More time for installation is required. 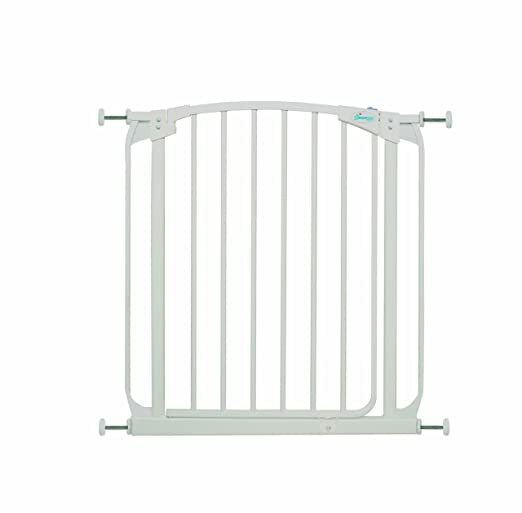 Pressure-Mounted is the most common type of baby gates in the market. It uses a tension system which makes installations easy. Installation and removal are a snap. Drilling holes are not necessary. Usually, it is cheaper than hardware-mounted type. Have a vast range of selection. The possibility of coming unsecured with enough pushing. Big animals like dogs can crash through it. Can damage dry walls by pulling off paint when removed. Not suitable for top of stairs. Each gate designed for particular area or purpose. For example, you cannot place a gate with a step-over bottom at the top of the stairs. This factor is significant. You should look for the best type of mounts when choosing for the best baby gates for stairs. You might also want a gate that is easy to put up or move around. A standard sized doorway or hallway opening measures 32'-36" wide. In cases of variation in sizes or situations that need extra-wide gates, it is necessary to measure first before choosing what to buy. Luckily, almost all baby gates have expandable width. ​You might opt to purchase an extra-tall gate for added security especially when you have a bigger kid. ​Your baby gate for stairs needs to be strong. It must be sturdy enough to be able to stand up to any falling weights or pushing over them. ​The lock also needs to be child-proof. It should be difficult for babies or toddlers to figure out. Some gates have automatic locks that will ease your mind in the case that you have a habit of being forgetful. ​You might also want to open the gate with one hand especially when the other hand is busy holding or carrying something. ​You can get gates with a small door for pets to pass through. In the case of keeping your large dogs out, choose a gate that is sturdy and extra-tall. A hardware-mounted type of gate tightly secured. No bottom threshold for prevention of tripping over. Have an opening toward the upstairs. An auto-lock features in case you forgot to close it. No automatic swing shut to prevent the swinging gate from bumping you in the back. Bottom stairs must have the same qualities of the top of stair gate mention above; only you can choose to use either of the two mounting types. 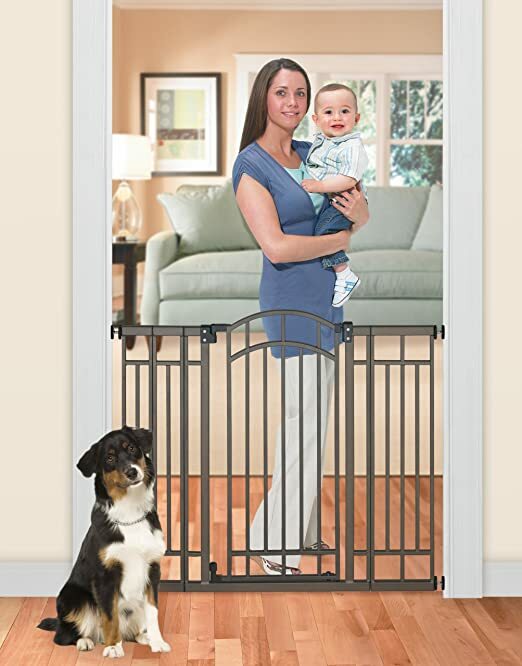 The Dreambaby Chelsea Auto Close Security Gate will ease your mind with its double-lock and auto-close features. Additional extensions are sold separately for huge 111” extra-wide openings. If using an extension, install it to your gate by attaching the extension first. Pressure mounting is a fuss-free installation with no screws and drilling. This gate opens in both directions and provides you one-handed opening system. It has an auto-lock mechanism that is very difficult for children to open which is good. Perfect for bottom stairs but can also be used at the top of stairs- just use the hardware mounting cups. This gate is available in stylish black or white. A double-locking system that will give you peace of mind. The Summer Infant Extra Tall Walk-Thru Gate carries not only good looks but also provides extra security. The extra tall design helps parents not to be able to reach down so far to open the gate. It comes in a sturdy bronze metal finish with 3-feet of height ideal for your toddlers and large pets and can expand to up to 48”. However, because it is a walk through gate, meaning you have to use a doorway to open. Others claim it is narrow for them to pass through which is the downfall of this product. Included is a removable door stopper and packed with hardware for more secure installation. However, the bar at the bottom of the gate will make you think twice if you want to install it at the top of your stairs. Evenflo Top of Stair Plus Gate is 4-point hardware-mounted wooden gate specially made for the top of the stairs. It provides a one-handed operation for easy opening and closing with a childproof lock which means it is challenging for children to open. The convenient opening that swings both ways includes a removable control to prevent it from swinging out over the stairs that may cause a falling hazard. 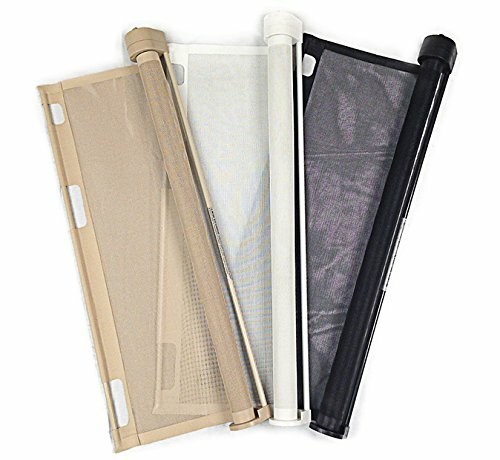 It can fit any opening size variations through its expandable width range from 30" to 48" wide. However, if you want to install it on your bannisters, you need to buy an installation kit. 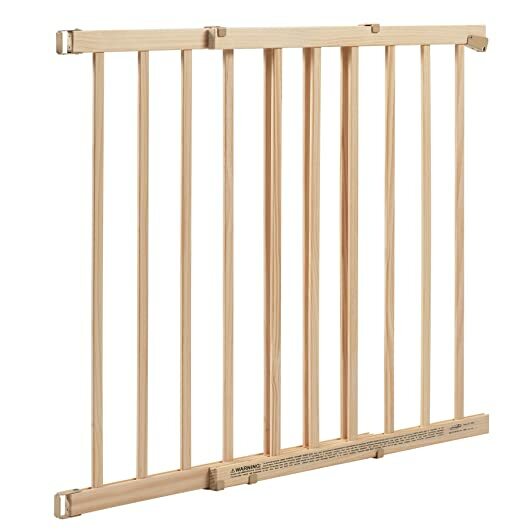 It is inexpensive at only $33 and taller than other gates with a height of 32”. This Retract-A-Gate Safety Gate may be more than twice the cost of the other type of barriers but is surely worth it. Its unique features also offer maximum safety. This gate is certified for use at the top and bottom stairs by the JPMA. The child-proof lock prevents kids from opening the gate. The see-through mesh is tough, scratch resistant, and washable. It retracts into a roll when opened or not in use. It offers a broad range of up to 72” and a tall height of 34” and comes in three colours- white, black, and café. Regalo Easy Step Walk Thru Gate is true to its name with its convenient walk-through door with a lever-locking design handle that can be open by one hand and a one-touch release mechanism. Package includes wall cups for added security. Pressure mounting provides easy installation and removal. Some found the opening narrow which is not good if you are carrying something. Finally, you have to choose and decide to purchase your best gate. Please make sure to read the instructions for installation. And be sure to check and re-adjust the mounts if possible for continuous safety and protection. Keeping your baby safe is the reason why you need to install barriers on your staircases. Because it is your kid’s safety on the line, the strength and durability of your gates should be the top consideration. ​For this reason, we’ve chosen the Dreambaby Chelsea Auto Close Security Gate as the winner of this round. Your decision on choosing the right gate will depend on your space and the level of security you want to achieve. Whatever is your pick, one thing is for sure; all the gates on the list provide you with the best safety and security your child could ever have.